Russ Taff was born the fourth of five sons to a fire-breathing Pentecostal preacher father and a gospel music-loving mother. He learned early on that when he sang, people sat up and responded with feeling. Some of his earliest memories are of being balanced on the church altar by his mother's strong arms while he belted out a gospel chorus to the rollicking encouragement of the tiny congregation. His trademark rich, emotion-drenched vocals were formed in that fertile environment. His mother's extensive collection of gospel records was the only form of entertainment their strict upbringing allowed, so after school Russ would rush home to listen to his favorites. Lying on the floor between two old stereo speakers, the plaintive, powerful sounds of artists like Mahalia Jackson and the Five Blind Boys From Alabama literally filled his head with music. "It really spoke to me," Taff says. "I would close my eyes and just float away with those voices." A natural harmony singer, Russ often teamed with his brothers to perform songs by the great quartets of the day-The Blackwood Brothers, The Gospel Echoes, and The Statesmen (featuring his favorite singer, Jake Hess.) "Those guys were like the Beatles or Elvis to me," Russ laughs. "I used to practice their moves in front of my bedroom mirror, and try my best to sound just like Jake!" When Taff moved to Arkansas in his teens, he began listening to popular music for the first time in his life, and found inspiration there, too. Contemporary Christian music was gaining prominence and the traditional lines between 'secular' and 'sacred' were starting to blur. Russ formed a local band called Sounds of Joy, and began writing songs that combined the spiritual truths of his childhood with the music of his generation. Two years after his band served as an opening act for the legendary Imperials, Taff was invited to join them as lead vocalist. With the Imperials he toured extensively and gained recognition as 'The Voice' behind award-winning songs and albums that successfully completed the group's transition from traditional to contemporary Christian. Eager to experience and explore all aspects of music, Taff left the Imperials after four and a half years to pursue a solo career. He captured the imagination of the industry by successfully releasing a series of innovative works that delved into his musical heritage while pushing the boundaries of contemporary Christian music. Taff's lyrics, often co-written with his wife Tori, chronicled his personal spiritual path. Soaring, aching, raucous or tender, the songs Russ chose to wrap his one-of-a-kind voice around were unflinchingly honest. Artistically, Taff was always authentic but never predictable. His eclectic taste was reflected in his recordings and live concerts, as he drew from all genres-- rock, pop, blues, Southern gospel, Black gospel, country, even big band. "I guess I'm just not a right-down-the-middle kind of guy," he cheerfully admits. "I've been influenced musically by so many styles that I try to never place restrictions on myself. If it moves me, I figure it will probably move other people too." Apparently he's right. However you choose to label it, Russ Taff's music has won him not only a wide audience and critical acclaim, but a total of five Grammy awards and nine Gospel Music Association Dove awards. 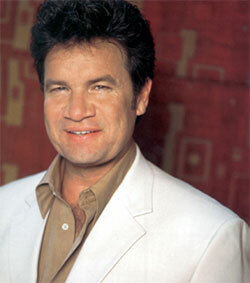 He has been hailed by Billboard Magazine as "the single most electrifying voice in Christian music." But he never forgot where he came from, or the sounds that first stirred his soul. In 1991, Russ was invited by his long-time friend Bill Gaither to be part of one of his fledgling Homecoming videos, which honored and celebrated their mutual musical roots. Soon after that, Russ began making occasional guest appearances at the Homecoming concerts. He immediately fell in love with the experience of sharing the stage with some of his childhood heroes, surrounded by the Southern gospel music he grew up singing. Taff says simply, "I knew I belonged here." He eventually became a regular artist on the Homecoming Tour, and in a surprise move, joined the famed Gaither Vocal Band as a baritone in 2001. He toured as a member of the group for almost three years, and the two projects recorded during his tenure earned unprecedented back-to-back Grammy nominations. Early in 2004, in the wake of the deaths of Homecoming legends Vestal Goodman and the beloved Jake Hess, Russ decided to step down from the Vocal Band and return to his solo artist status on the tour. A perennial Homecoming favorite, his soulful, passionate vocal presence continues to be featured in concerts and videos. Taff's musical journey has truly come full circle, but it's far from over. As an artist, he is clearly at the top of his form. And as a man, he is the picture of gratitude and grace. "God called me to sing when I was just a little preacher's kid in Farmersville, California," Taff says with a smile. "And He's still calling!"